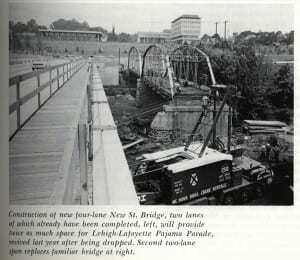 The Fahy Bridge (The Philip J. Fahy Memorial Bridge) that connects South and North Bethlehem replaced the “old” New Street Bridge in 1970. This photograph from the Lehigh Alumni Bulletin (Volume 58, No.1, October 1970) shows the construction of the new Fahy Bridge and the destruction of the New Street Bridge over Lehigh River. I am wondering how many other bridges in the US are named after police who have died while on duty. I think this is probably a fairly new phenomenon. Any insights?